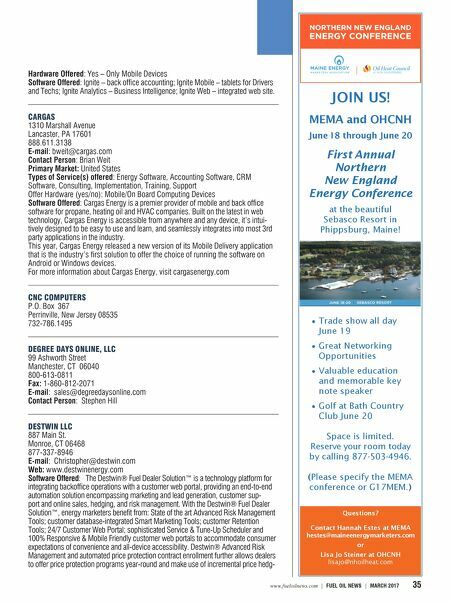 34 MARCH 2017 | FUEL OIL NEWS | www.fueloilnews.com BUSINESS OPERATIONS: COMPUTER SYSTEMS BUYERS' GUIDE ABILIS ENERGY 1010 Sherbrooke west, 1900 Montreal Quebec, Canada J2X4J3 514-225-4145 ADD SYSTEMS 6 Laurel Dr. Flanders, NJ 07836 800-922-0972 E-mail: Coylej@addsys.com Marketing Area: North America and Canada Contact Person: John Coyle, Sales Manager Types of Service(s) offered: Types of Service(s) offered: ADD Systems is a software solution leader, providing the most comprehensive systems available since 1973. With a staff of industry specialists and a customer base spanning the United States and Canada, we're experienced and ready to help you grow your business. Software is just a fraction of what we do. We are a complete provider, including consulting, implemen- tation/training services, data conversion expertise, software development, disaster recovery, forms and much more. Hardware Offered: Yes. ADD Systems can provide hardware for all aspects of your business. We address both the back office and the field with vehicle hardware for our on-board solutions. If you prefer, we can even manage all of your back office hardware needs through the popular ADD cloud. Software Offered: ADD Systems has created the latest soft- ware solutions, specifically designed to meet the needs of industry professionals. ADD Energy E3® is a robust back office application that delivers everything you will need from accounts receivable to dynamic dispatching. Go mobile with our Raven® and Pegasus® platforms, our on-board delivery solution for fleets of all sizes, and our service tablet for service and HVAC companies. Connect with your custom- ers via a real-time customer web portal using the versatile SmartConnect® platform. If you operate gas stations or convenience stores, we have you covered there too! ADD eStore® is an enterprise software application for home office and back office convenience store operations. It provides comprehensive tracking, analysis and management of sales, purchases and inventory. When it comes time to analyze your business information, choose Atlas Advanced Business Intelligence® to turn your data into actionable information. Simply put, no one knows your industry better that we do. Remarks: To learn more visit addsys.com/products. AMERICAN BUSINESS FORMS & ENVELOPES 7134 Brangles Road Marriottsville, MD 21104 800-519-3691 Fax: 800-649-5179 E-mail: john@amerbusforms.com Web: www.meterticket.com Primary Market: United States Contact Person: John or Steve Leary Types of Service(s) offered: Provide custom printed and stock fuel delivery tickets, invoices and statements to fuel and propane dealers. Hardware Offered: No Comments: We are a family business that has been providing printed products to the fuel industry for over 15 years. Please call us for a price quote before your next order. AUTOMATED WIRELESS ENVIRONMENTS, INC. 125 Rt. 181 Lake Hopatcong, NJ 07849 973-663-6990 Fax: 973-810-3767 E-mail: daves@automatedwireless.com Primary Market: US and Canada Contact Person: David Shiffer Type of Service(s) Offered: Since 1973 AWE has offered Enterprise Energy Management Software with On-Board Wireless Software developed in 1992 for POS Wireless Delivery, POS Wireless Service, Mobile Fleet Fueling Divisions and On-site fueling. Hardware Offered: Yes Software Offered: E-System, RF Delivery, RF Service, RF Fleet-Fueling, and RF Transport. Remarks: Through our industry leading software and technol- ogy solutions, leading marketers, distributors, retailers and service companies across North America are growing their businesses with greater profitability. AWE has proven to be a stable partner. This has been achieved by helping our cus- tomers realize the benefits of utilizing technology, providing innovative products, solutions and standing on the foundation that our solutions provide true results and consistently deliver and increase operational efficiency. Contact us today and learn how we can automate your environment. BLUE COW SOFTWARE 50 Salem Street Lynnfield, MA. 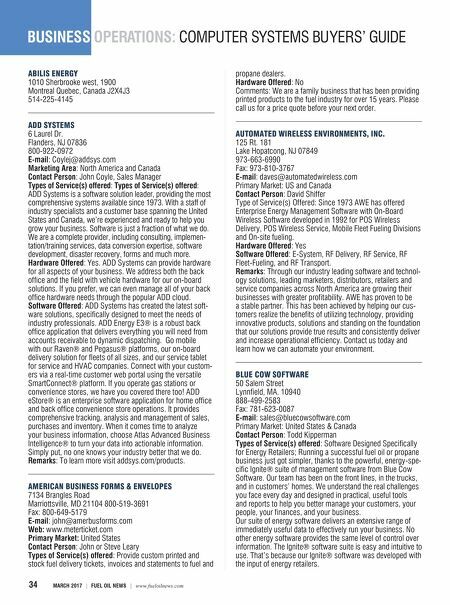 10940 888-499-2583 Fax: 781-623-0087 E-mail: sales@bluecowsoftware.com Primary Market: United States & Canada Contact Person: Todd Kipperman Types of Service(s) offered: Software Designed Specifically for Energy Retailers; Running a successful fuel oil or propane business just got simpler, thanks to the powerful, energy-spe- cific Ignite® suite of management software from Blue Cow Software. Our team has been on the front lines, in the trucks, and in customers' homes. We understand the real challenges you face every day and designed in practical, useful tools and reports to help you better manage your customers, your people, your finances, and your business. Our suite of energy software delivers an extensive range of immediately useful data to effectively run your business. No other energy software provides the same level of control over information. The Ignite® software suite is easy and intuitive to use. That's because our Ignite® software was developed with the input of energy retailers.